So with two bottles of V, and a packet of Twisties I was set to jump in and be a ... Helljumper. Game setting: Heroic, No skulls. Attitude: keen to explore a little, keeping it clean, mostly interested in the story. An interesting opening scene falls way to a very dull start. Walk around Mombassa, find a few things, shoot a few things. The real action of ODST is the vignettes where the Rookie (you)You get to play in the scenes the Rookie is piecing together traces what has gone on in the past 6 hours. Bungie step up big time in this regard and deliver some remarkably fun set pieces to play. Blowing up bridges, heavy defence scenarios, sniping, strange looking creatures and decent enemy AI means some seriously fun engagments. I did however find wandering through Mombassa slow going and quite dull at times. If I had to call fault on one thing, it's how Bungie consistently fail to decent face detail for their human characters in the Halo series. The music was very different to previous Halo games. There was no cast back to previous Halo themes here. When playing as the Rookie, the music was moody with saxophones. When belting out the pain to attacking Brutes and Hunters the music was punchy. The plot evolves around a secret mission that is foisted on the Rookie and his team. It's not explained till the very end why everything is happening and it's hardly anything to write home about but it's nice in its own way. A small payoff at the cut scene following the credit roll will make some fans happy. 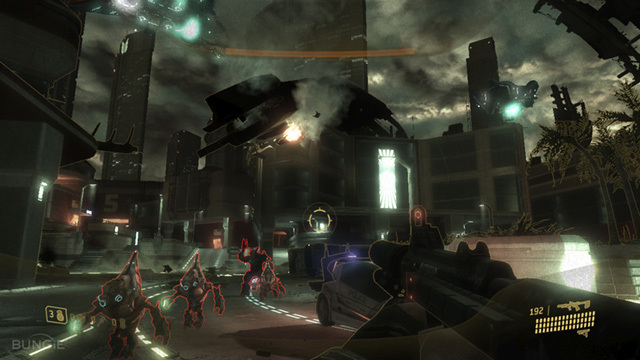 Overall I found ODST to be a remarkably solid game. It took me around 8 hours which seemed long enough. Playing through on Legendary will take some patience as there are some tough battle scenarios to run a through and some Libraryesque levels near the end. Playing this game feels like Halo 2 perhaps should have - all the benefits of the bells and whistles of the third with an OK ending. It has big repeat value and the addition of Firefight! Fans of Halo will probably enjoy this game a fair bit. If you are a noob, I suggest you check out Halo 3 before you try ODST. P.S. Did anyone figure what whvidldshbyjsdo is in reference to yet? Check out my review of Halo 6.